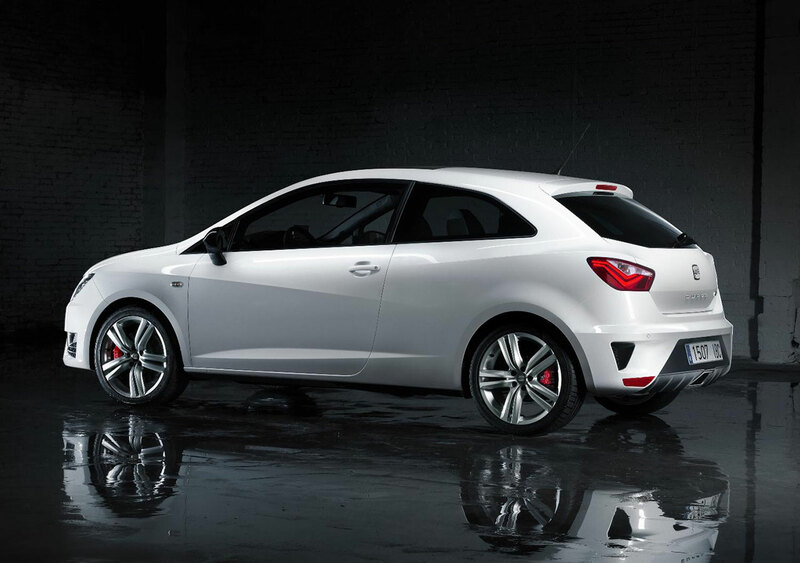 SEAT today raises the bar in the supermini class with the introduction of the sensational Ibiza CUPRA. Shown first as a concept during April’s Beijing International Automotive Exhibition, the Ibiza CUPRA is barely touched production form. The Ibiza CUPRA is the very essence of the SEAT brand: stunning design, amazing performance and state-of-the-art technology. Those qualities come together in a package that’s simultaneously compact and versatile, making the Ibiza CUPRA an extremely compelling day-to-day performance car. Performance is scintillating, with a 0-62mph time of just 6.9 seconds and a top speed of 142 mph, yet it is exceptionally efficient, with average fuel consumption of 47.9 mpg. 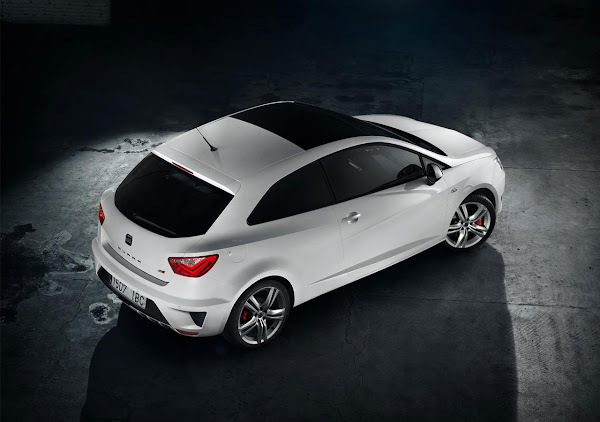 Due to arrive in the UK in January 2013 priced at £18,825, with order books opening next week, the new Ibiza CUPRA follows more than 16 years of heritage. The CUPRA name was born in 1996 as a special, top-of-the-line Ibiza built to commemorate SEAT’s World Rally Championship victory in the 2.0-litre category. Since then a CUPRA has always featured in the SEAT model line-up, with the name adorning both the Ibiza and Leon ranges. Powered by a 1.4-litre TSI petrol engine that develops 180 PS and 250 Nm, owing to a turbocharger and a supercharger as well as direct injection, the latest Ibiza CUPRA is truly worthy of the name, and begins the next chapter of the CUPRA success story. The state-of-the-art TSI power unit is a compact piece of high-tech equipment that guarantees exceptionally refined performance during day-to-day driving, while a unique sound actuator in the exhaust system allows for an extra sporty sound when the driver desires it. And for extra driver involvement, the seven-speed DSG twin-clutch automatic transmission, with its extremely short shift times, can be operated via paddles mounted behind the steering wheel. 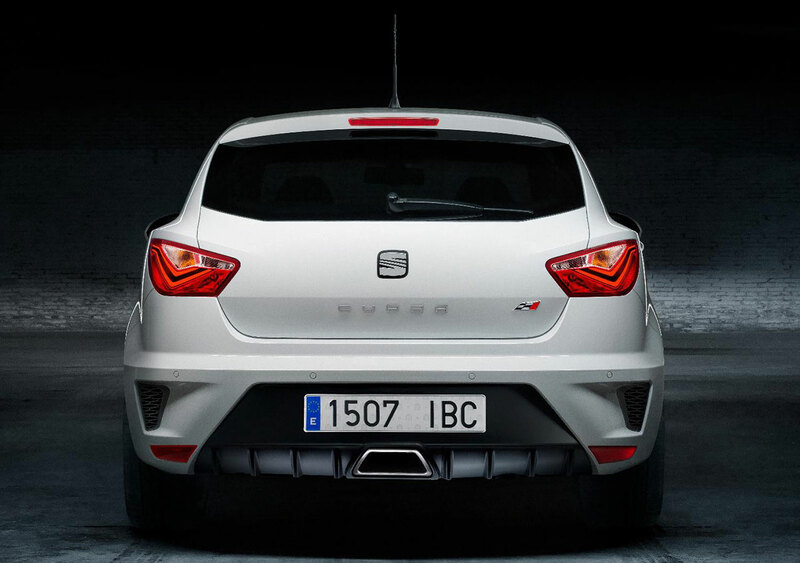 The chassis of the Ibiza CUPRA has been tuned for maximum agility and precision. The ride height has been lowered compared to the standard car, and an optional AP Performance braking system is available, offering remarkable stopping power. An XDS electronic differential lock reduces the tendency to understeer and improves handling through fast corners, and an ESP electronic stability system incorporating hill start is part of the safety package that comes as standard on the Ibiza CUPRA; the car has been awarded the maximum five stars in the Euro NCAP crash test. The expressive design of the new Ibiza CUPRA is obvious from the very first glance – a dynamic supermini with a solid and powerful stance. 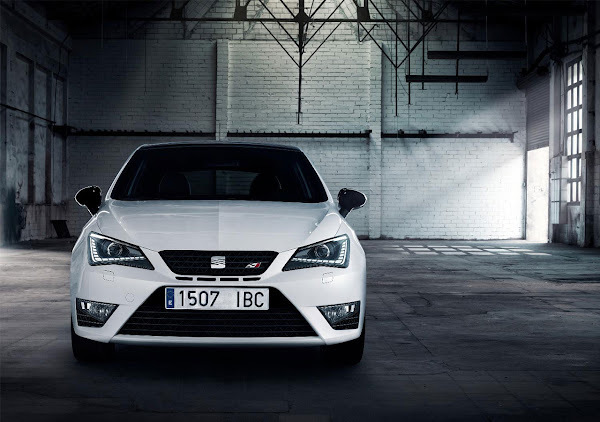 The new face, which brings the CUPRA in line with the recent Ibiza model update, gets a broad grille and very forceful air intakes to emphasise the breadth, solidity and power of the car. The sophisticated design of the front headlamps shows the attention to detail inherent with SEAT workmanship. The edgy lines of the standard-fit bi-xenon lights are typical of the new SEAT design language, while being perfectly integrated into the Ibiza’s sculptural form. The LED daytime running lights trace the line of the headlamps to deliver a unique light signature, as do the LED rear lights. The bi-xenon headlamp technology delivers perfect illumination, while cornering lights are integrated into the large fog lamps. The side view of the three-door coupé is brought to life by the sharply defined lines and edges, with the muscular rear shoulders and exclusive 17-inch wheels underscoring the car’s dynamics. The black, high-gloss exterior mirrors provide a clear contrast to the paintwork of the Ibiza CUPRA, while the powerful rear end underscores once again the special role of the Ibiza CUPRA as the new benchmark for compact cars – a broad bumper frames the substantial, matte black diffuser incorporating the trapezoidal exhaust outlet. The emotional power of the exterior design is repeated in the interior of the Ibiza CUPRA, in its extremely minimalist, clearly structured cockpit; the exceptional feeling of quality, the ergonomic excellence and the precision of the workmanship all underscore SEAT’s dedication to detail. The new sports steering wheel features the CUPRA logo, and the shift paddles for the DSG transmission are within easy reach of the driver’s fingertips. Additionally, the CUPRA features unique sports seats with optional two-colour leather upholstery, underlining the very special position occupied by this top-of-the-range Ibiza. The entertainment system in the Ibiza CUPRA is completely new – the high-performance audio system is enhanced by the innovative SEAT Portable System. The highly functional unit, which debuted in the Mii city car, is removable for mobile use yet perfectly integrated into the vehicle electronics system. Its extensive functions include a navigation system, Bluetooth audio streaming, a Micro SD card slot for music storage, hands-free phone system with voice control, and an on-board computer. Additionally, a ‘photoframe’ facility allows users to personalise their system with images, while a useful ‘notepad’ function allows occupants to set handy reminders, and the screen can act as a torch for users when they leave the car at night. As the flagship car of the Ibiza range, the CUPRA gets a number of standard equipment items over and above the Ibiza FR, which itself is a generously equipped model. Climate control, rain-sensing automatic windscreen wipers, bi-xenon headlamps, LED daytime running lights, and 17-inch alloy wheels are standard fit, as well as the aforementioned CUPRA styling and performance-enhancing accoutrements, including signature gloss black mirrors, CUPRA front and rear bumpers, matte black rear diffuser incorporating a large trapezoidal central tailpipe, and a pair of unique front sports seats.